You may find it helpful to read Part I on Primal eating first or start all the way back at the beginning of this journey by reading Nature -vs- Technology. If you don’t like clicking those links, you’ll want the following reference information. These are the 10 Primal Laws. Laws 3, 4, and 5 form the exercise philosophy inherent in The Primal Blueprint and we’ll focus on exploring these concepts. Here’s a visual representation of this philosophy in the form of everyone’s favorite shape – a triangle. While you may be thinking that you have to train by leaping onto triangles, killing prey with a spear, and wearing a sparse skirt, don’t fret. The Primal training plan is actually pretty simple. Primal Law #3: Move Frequently at a Slow Pace. The majority of your “training” is low-intensity exercise. As the triangle states, this can be walking, hiking, or any activity that gets you moving, while not being so winded that you can’t easily maintain a conversation. Some easy ways I hit these targets are: walking by dog, taking a 5-minute walking break every 60-90 minutes at work, and modifying some of my more intense training routines. I’m spending more time focusing on my martial arts technique and less time pounding the heavy bag into submission like Rocky sparring a human-sized side of meat-factory-ribs. I’ve cut out one of my weight training workouts and substituted Power Yoga. 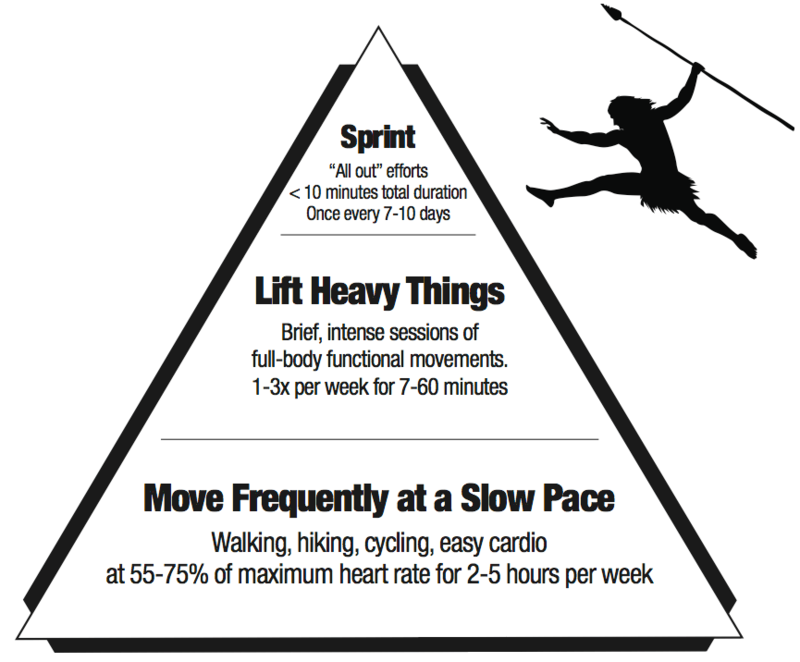 I spend 4-5 hours a week training at a low intensity level, but as the triangle shows, you could train as little as 2 hours and expect to see benefits. That might be a challenge for some, but get creative and find a way to make it work. For me the challenge is lowering the intensity of some of my existing training, but this is counterintuitive for most. Why would I lower the intensity of my training? How does that make you bigger, stronger, faster? Remember, the goal for me is not purely getting bigger, stronger, and faster. The goal is getting healthier. Intense training depletes your body of glycogen in your cells. Your body naturally feels weakened and wants to refill those cells immediately. Your brain sends you a signal to eat lots of carbohydrates, preferably sugar. If you read Part I, you’ll know that this is what we’re trying to avoid. This process will begin the repeated up-and-down cycle of insulin and blood glucose swings that promotes fat storage and temperamental energy levels. I’m experimenting with this approach and so far, I feel like my lung capacity isn’t diminishing, my speed remains, and I’m getting stronger and leaner. I think this is an excellent approach for anyone that isn’t training to become an elite athlete. Primal Law #4: Lift Heavy Things. The goal is to lift in a fast-paced manner once a week for 30 minutes and once a week for 10-15 minutes. That’s it. For most people with extensive weight training experience, that’s not much strength training, but it works. Since I’ve started CrossFit, my functional and core strength has improved dramatically. Functional strength is what you need every day to be productive. Lifting boxes, leaping out of the way of buses or bullets, or carrying your Dad’s 10 bottles of ginger ale into his apartment in one trip are all examples of everyday activities that you can perform better with improved functional strength. If you’re not familiar with weight training, join a gym that will teach you how to lift correctly (like CrossFit) or hire a personal trainer for a month. It may seem like a lot of money to pay when you hear the price, but think about the value of your health. Would you rather pay to learn how to be healthy now and for the rest of your life or pay medical bills in the future? Remember, that you don’t have to spend a lot of money for a long time. Spend the money to learn enough to train safely and then workout on your own. Alternatively, use reputable Internet sites to learn the key bodyweight exercises (Squat, Push-Up, Pull-Up, Plank) and do them on your own. I know, I know. Pull-Ups 🙁 Get a bar. Learn how to do assisted Pull-Ups. It’ll be okay. Primal Law #5: Sprint Once in a While. The idea here is to increase your lean mass, stimulate your metabolism, suppress your appetite, and increase your insulin sensitivity through the most intense, short bout of cardio you can handle. The most basic example is to run as hard as you can for 8-20 seconds and repeat 6-8 times after warming up with 6-8 lower intensity sprints. You could substitute biking, rowing, or a number of other activities and you don’t have to start with 100% effort the first week. Start at 75% and work towards 100% intensity. The author recommends doing this every 7-10 days, but skipping this training if you don’t feel like it. Often you don’t feel like sprinting because something else is wrong – mild sickness, depleted glycogen stores, recovering from another workout – and training intensely will exacerbate these issues. That’s fine. Skip it and try again next week. That’s the Primal training plan. 2-5 hours of low-intensity exercise plus 1 x 30 minute strength training session + 1 x 15 minute strength training session plus 1 x 15 minute sprint workout equals 3 – 6 hours of time per week devoted to keeping your body & mind healthy. Try it for a month and see how you feel. I expect that you’ll begin to notice physical changes and a better mental state of mind, while still having enough energy to complete your other responsibilities. After a few months this training will cyclically give you more and more energy as your strength and lung and heart capacity improves and your body and mind can get more done in all areas of your life with less effort. The goal is to start on the right and move slightly to the left. You must drop the soda and scale some triangles.